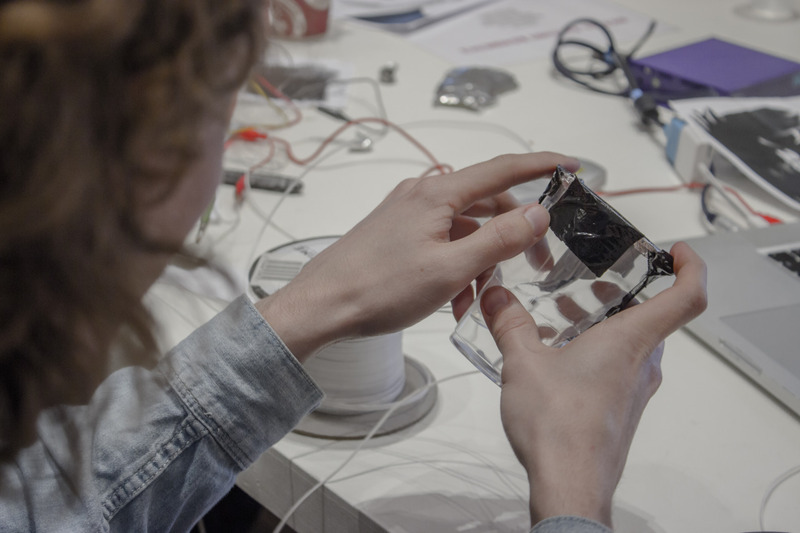 Digital Factory facilitator and Artist Frazer Merrick shares his Makey Makey workshop. Part of my role on the digital factory project at Firstsite is to introduce the artists to new technologies, and let it influence their practice. We began with some performance work, a simple choreography of ‘pat-a-cake’ alongside a banana piano, was a perfect introduction to what the technology is and how it works. 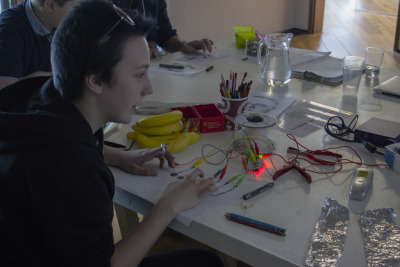 Then the group moved on to drawing games controllers with graphite and jumping onto the mini clip website, its incredibly rewarding to see your drawing come to life in such a simple way. I then showed them how it can trigger MIDI, so your drawings could control lights, music and so much more! When it comes to using Makey Makey as part of an art installation, the biggest limitation I’ve found is that you have to be touching an earth and an input to create the complete circuit thats needed for a trigger/action. This can break the illusion a little, whilst also adding clutter. It means you can’t just run up to the installation and start interacting, it needs a small amount of explanation. However, during this workshop we did discover an interesting example of integrating the earth into the installation with our ‘Water Joystick’! With the earth on the bottom of the cup, we taped three cables down the inside (left, forward, right). Now imagine you’re playing a racing game, if you tilt the cup right then the water will be touching both the bottom earth and the right. If you need to go forwards (accelerate) and right, then tilt it forwards and right…and it works! I can’t wait to see how the artists embrace this technology in their practice!